If you're interested in reading Usagi, but don't know where to begin, here's a handy reference to address just that question! While Usagi has a meticulous continuity spanning over thirty years, it's generally written so that a new reader can pick up almost any given issue (including current issues on the comic store shelves right now) and immediately understand what is going on. 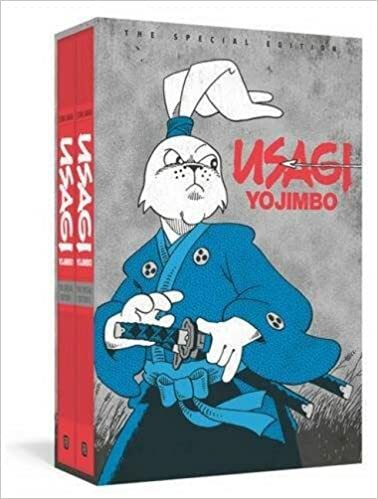 The Usagi Yojimbo Saga Editions (reprinting Usagi Yojimbo vol. 2 #1-16, as well as Usagi Yojimbo vol. 3 #1 to present). This will give you every regular Usagi story ever printed. And, when you're done with those, if you're craving more Usagi, don't forget to check out Space Usagi and Usagi Yojimbo: Senso. For me, personally, though the early stories are fun, Usagi doesn't really start to take off until "The Dragon Bellow Conspiracy" (the second half of The Special Edition), and it doesn't truly become a masterpiece until the second Saga Edition, but opinions vary. Regardless, if you want to experience it all and get the full backstory on each supporting character and event, this is how to do it. I have read the first tpb and found it to be very enjoyable. Seriously, if you enjoyed the first one (and really, it is fun), you have no idea how much better it gets from there. I like the rhino guy. I hope he doesn't buy the farm later in the series. I recommend starting at the beginning. You only have to get past the first few stories to really be enjoying it, I think. "Bounty Hunter", "Homecoming", and "Blind Swordspig" are all great and very early stories. And it just builds from there. I think it reaches masterpiece status by the time of "Dragon Bellows Conspiracy". Which is what I recommend to people. Start at the beginning and get as far as Dragon Bellows. You'll be hooked. That's 4 volumes in the old slender editions, but now conveniently a single book of the special edition. As much as I generally agree with all of this, you have to admit that the series attains a whole new level with Grasscutter and the stories that follow. Really, the series continually gets better and better over time, rewarding you for sticking with it. There are few stories that have ever felt repetitive to me in terms of Stan's progression as an artist. 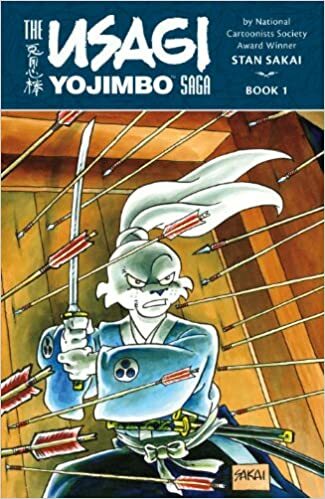 However, if you want to venture back to the beginning, the easiest way is to begin with The Usagi Yojimbo Special Edition (reprinting the early appearances and Usagi Yojimbo Vol. 1 #1-38), and then move on to The Usagi Yojimbo Saga Editions (reprinting Usagi Yojimbo vol. 2 #1-16, as well as Usagi Yojimbo vol. 3 #1 to present). When you're done with those, don't forget to check out Space Usagi and Usagi Yojimbo: Senso. For me, personally, Usagi doesn't really begin to get fun until the second half of The Special Edition, and it doesn't truly become a masterpiece until the second Saga Edition, but opinions vary. Either way, if you want to experience it all and get the full backstory on each supporting character and event, this is how to do it. I try just about anything you guys tell me to. I'll probably be getting this soon. Besides, I keep seeing it at my LCS (not the deluxe edition, but some Usagi book, but I never get it because it would be a totally random starting place, and I'd probably be starting in some random story arc). Do we ever stear you wrong? No undersea characters in speedos, but otherwise I think you'll love it. I have been reading so much more than just Sub-Mariner lately. Hi Coldwater, yeah, I know how you feel. It's the same way with me, trying to find out a good starting place in a new comic. Usagi has over 200 issues so it can be quite intimidating (I'm working on this). For now, I'd suggest getting Saga 1, as it's quite action packed! If you get the paperback, it's also fairly inexpensive for a good amount of comics. Currently, we (and Dark Horse) are sold out, so I'd suggest going on Amazon. Sorry my writing format is weird, I'm not used to forums yet. For now, I'd suggest getting Saga 1, as it's quite action packed! Personally, I couldn't skip The Special Editions. First meeting Tomoe, Gen, Spot, Ino...Circles, The Dragon Bellows Conspiracy! If you really want to be there for it all, you've got to start at the start. I will probably get the Delux HC, though. But before I go, can someone help me with the proper pronunciation of "Usagi Yojimbo"? Is it basically "you-soggy yo-himbo"? There are three different things that you could mean by "The Deluxe HC"
Do you mean The Gallery Edition? That does, indeed, start at the beginning, but it's way out of my price range. More power to you if that's how you're going to experience the series for the first time!